Do you want a role where you will have the opportunity to learn and grow? Do you want a role that has big impact on both the community and the company? Do you want to be part of a happy, supportive, and ambitious team? Then we are looking for you! That’s right, Raintree is offering unique opportunities for three people to join our awesome team this year. As our project approaches its second birthday, we’re growing fast and need to expand the Raintree family. We often get asked “What is Raintree?”. It can be a difficult question as we do so many things within our project. 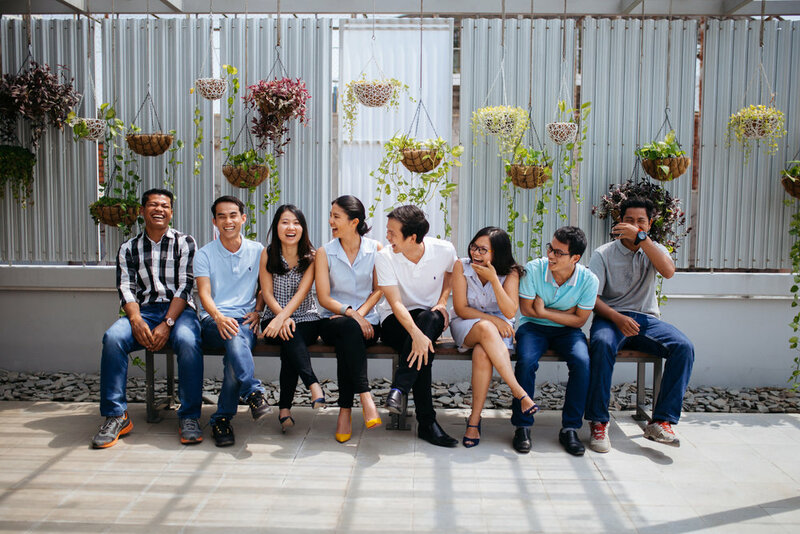 Foremost, the project is Cambodia’s first creative office development housing diverse tenants of all sizes from multi-nationals like Microsoft, Uber and Havas Riverorchid, to local hero organisations like Brown Coffee and Teach for Cambodia. Secondly, we believe space and design can empower our community, so aspire to contribute to the education, entrepreneurship, arts, health and wellness sectors through our event space and a curated events programme. Most simply, we are an award-winning building with big dreams, who care about our people and our community. Our team are a core and fundamental part of realising these dreams. We invest in our talent and ensure you are on a development path that is right for you. We all work hard, but enjoy the journey of building something new together whilst supporting each other to develop personally and professionally. Below are the opportunities we're hiring for, with details on who you should be and what experience you need. We are excited to welcome you to Team Raintree! Job description: As Commercial and Community Manager you will be the commercial force of the Raintree team by leading business development and leasing. This includes attracting new tenants, managing existing tenants, and creating partnerships with organisations and individuals for the project. You will liaise with the finance team, manage contracts and ensure that the operations team are supporting Raintree’s business activity. The role will give you the opportunity to learn about the real estate sector if you are new to the industry, or hone your skills with a pioneering development. You will also be responsible for building a thriving, open community with the events team, intersecting the private, public and non-profit sectors. This is a unique opportunity to propel a young, dynamic project both commercially and socially. You will report directly to the Managing Director/CEO. Ideal candidate: Good problem-solver, negotiator, and willingness to learn. Enjoy starting and developing relationships with diverse, often senior and ambitious individuals. Excited to be part of a high-performing team, interested in both the business and giving back to the community. Self-starter and hard-working. Requirements: Minimum 3 years work experience in any business or commercial role. Real estate or sales experience is a bonus. Basic Microsoft Office computer skills, fluent in Khmer and English. Job description: As part of the Marketing and Events team, you will have a creative and impactful role shaping the brand of Raintree to the world. Working closely with our graphic designers, you will create and execute an exciting marketing plan, including social media, digital content, print and press. You will also help to conceive a dynamic events programme in conjunction with a variety of partners including non-profits, arts organisations, community groups and corporates. The programme will cover education, tech, wellness and creative industries (as well as any of your own ideas!). You will report directly to the Managing Director/CEO, but supported by associated marketing teams. Ideal candidate: Love design and excited to be building a creative, dynamic brand. Enjoy working with digital and social media. Interested in contributing to the local community. Good communicator, work well with agencies and across teams. Hard-working, flexible and independent. Requirements: Minimum 2 years work experience in marketing or media role, including social media. Any Photoshop, Illustrator, graphic design or photography experience is a bonus. Basic Microsoft Office computer skills, fluent in Khmer and English. *We encourage more experienced candidates to also apply. Job description: As Admin and Client Executive, you will be one of the first faces of Raintree to welcome our partners, clients and guests to the building. You will meet many different people, from all walks of life - young and old, Khmer and foreign, professional and artistic. You will be responsible for providing relevant information and presenting the project to prospective clients. Along with the full operations team, you will have an important role in ensuring Raintree is known as the most friendly and professional building in Phnom Penh. As part of the Administration team, you will support the company’s documentation, administration, reception, logistics and even help organise events. You will report directly to the Office Manager, alongside the HR Manager. Ideal candidate: Friendly, good at talking to people and enjoy customer service. Highly organised, detail-oriented, quick learner and hard-working. Requirements: Minimum 1 year work experience in administrative, secretarial, reception or customer service role. Basic Microsoft Office computer skills, fluent in Khmer and good English. To apply please send your CV to hello@raintreecambodia.com including what role you are interested in and why. Still interested to work at Raintree but none of these jobs fit you? Don’t worry! Email us your CV and we will keep in touch if there’s a suitable role. We also offer part-time work and internships. Co-founded by Zoë Ng and Hok Kang, Raintree was launched in 2016 and awarded “Best Office Development, Cambodia” at the 2017 International Property Awards. The project is Cambodia’s first creative office development, comprising 3000sqm of flexible workspace, plus a rooftop event space for up to 200 people and an outdoor terrace. The development is community-focused and design-conscious to encourage the exchange of ideas and experiences. Since opening, the project has had several thousand visitors, worked with a range of inspiring private and third sector partners, and hosted events from hip-hop workshops to pop-up markets to startup weekends and career days. To learn a bit more about what we do, explore our blog on the News + Views section of our website. Newer PostRaintree's media mentions - property, property, property!